Colin Baker as the Doctor in Bloodtide. There. I said it. After the Sontarans, the Silurians are my second favorite Doctor Who race. The Silurians are an reptilian-species that were first seen way back during the Jon Pertwee years in the aptly named Doctor Who and the Silurians. The Silurians were once the dominant species of Earth, millennia before the dawn of man, with an incredibly technologically advanced society. When their scientists realized that the Earth’s gravity was going to capture the celestial body that became our Moon, the entire species entered cryogenic suspension, prepared to awake after the geographical upheaval that the Moon’s capture would cause. However, the time for their re-awakening came and went, leaving the Silurians still slumbering deep under the Earth. A few groups have awakened through the centuries; the Master reawakened them during The Sea Devils, underground drilling brought a group out of their sleep in The Hungry Earth/Cold Blood, and the infamous Warriors of the Deep saw a reanimated Silurian battleship attempt to capture an underwater nuclear missile base using the just-as-infamous Myrka. The concept of a whole other race who once ruled the Earth sleeping underground, waiting for the call to reawaken and reclaim their world, always appealed to me. Sadly, the last few serials which featured the Silurians as the main focus haven’t done them justice. Warriors from the Deep suffered from Margaret Thatcher’s surprise election, causing the BBC News to scramble for studio space and cutting into production time, whereas The Hungry Earth/Cold Blood is better known for the very end with Rory’s “departure” than for the story itself. 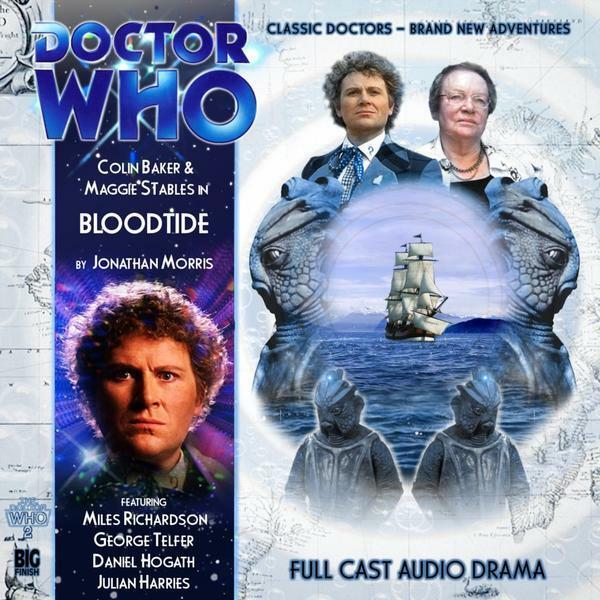 Bloodtide is the Silurian’s introduction to the Big Finish line, joining the Daleks and the Cybermen as returning villains. A solid serial that allows Colin Baker to shine and adds to the Silurian’s backstory, it ends up hampered by hamfisted writing that ruins a central character while beating the listener over the head with its message, wasting Maggie Stables in the process. When Doctor Who does historical serials, one of the main themes is always “take care not to change history.” This is one of those cases, where the Doctor cautions Evelyn not to assist Darwin in the creation of his theory of evolution. This, sadly, hampers the character. Maggie Stables and Colin Baker are a delight when they’re together, stepping out of the TARDIS and bickering like old friends from the very beginning, with Baker teasing her as she slowly realizes where they are and who she’s met. The fourth episode, where the Doctor sends Evelyn on a daring task, shows the bond that’s been built between them, and also lets Evelyn shine a bit as she outwits a Silurian by her lonesome in a brilliant little scene. Sadly, the second and third episode, where Darwin is at first crafting his theory and then lamenting how it conflicts with his faith in the Christian God, leaves very little for Maggie Stables to do, aside from polite agreement, disagreement, and providing comfort, all without risking a change of history. Colin Baker, however – the more I listen to Colin Baker, the madder I get at the mid-1980’s BBC. Pompous when he steps out of the TARDIS, full of rage when he realizes the deal Governor Lawson has made with the devil but willing to show mercy, diplomatic when he tries to show that the Silurians and humans can live together in peace but willing to stand his ground when confronted by the leader of the Silurians, Baker goes through a range of emotions without coming off as hammy (well, hammy compared to the Doctor by default). The Doctor shows off a unique talent in this serial as well; hypnosis. He uses it to calm down a scared prisoner and to draw information from several on-the-edge characters. It’s a bit jarring, but not out of place…after all, the Doctor does have a few surprises now and then, doesn’t he? The Silurians are an absolute delight as well. Tulok is a Silurian scientist who was banished by his people for committing the ultimate sin; upsetting the order of nature by experimenting on humans in an attempt to domesticate them to become both servants AND food to his people. Tulok’s revenge, though, is to sabotage the timing system on the hibernation chambers; hence causing his entire race to miss their wake-up call and leave them in hibernation, possibly for the rest of time. Daniel Hogarth does a great job as Tulok, showcasing the arrogance and pride of the scientist, referring to the humans as “apes” with incredible disdain that only Vislor Turlough could surpass. The way he mocks and disdains the theories of Darwin further drives this point home. Shvak, best described as his assistant, also has his moments, as he was the one who saved Tulok from banishment and realizes that his actions allow Tulok to sabotage the timing mechanism. Where Tulok could care less out of petty revenge, Shvak’s realization that he helped doom his species is quite moving. Oh, and Big Finish continues to redeem misused characters from the original series, in that the Myrka makes two critical appearances. Anyone who’s seen Warriors of the Deep knows just how big of a redemption this is. The supporting human cast, sadly, doesn’t quite live up to their Silurian counterparts. Greta, Captain Fitzroy, and Governor Lawson are “plug-and-play” characters; a woman in trouble, the authority figure, and the human working for the bad guys. They’re fine in their roles, especially when Lawson gets his comeuppance, but they’re not much to write home about either, though in this case, it’s more a case of the script than the actors. Miles Richardson is the biggest victim of this separation of script and actor. In our world, Darwin’s theory of evolution slowly caused the man to turn from his Christian beliefs towards agnosticism, as he tried to reconcile evolution with religion and found it difficult. While he was still active in his church and remained good friends with his vicar, he rarely attended Sunday services with his family and said “it’s hard for someone to be an ardent theist and an evolutionist.” Bloodtide’s writer, sadly, throws all that out the window as Darwin’s entire faith structure crumbles in a matter of hours. As someone who tries to be a devout Christian, I know it’s difficult to reconcile evolution and faith, and it’s something a lot of Christians struggle with through their lives. (Full disclosure: I believe in the theory of evolution, and the Bible is not literal history). Darwin’s struggle had to be pared down to fit into a two-hour audio play, of course, but the way Jonathan Morris writes the struggle is incredibly ham-fisted, and he beats the listener over the head with those very same hamhocks. Instead of soul-searching and debate, Darwin’s breakdown is one-sided, focusing solely on the scientific end because of a few finches. Granted, the revelation that the Silurians had a hand in the “guidance” of the human race would definitely kick at the support beams, but instead of quiet despair, Darwin rants and raves. The final showdown with Tulok has Darwin literally screaming “THERE IS NO GOD” over and over again. What could have been a thought-provoking conflict of science vs. faith instead boils down to the listener going “yes, yes, we get it, can we move on?” What makes it worse is that Darwin’s conflict could have been removed and the story would have been exactly the same. I should note that I’m not coming at this from a Christian’s point of view (like I said before, there is strong evidence, he says, wording it to evolution and the idea of the Bible as literal history is one that should not be entertained by a rational human being), but from a writing point of view. Even for all the liberties Doctor Who has taken with history throughout its run, this one just doesn’t work for me, and really came off simply as “creationism vs. evolution” without anything dramatic or worthwhile to add to the story as a whole. Which is a shame, because the Silurians get a LOT of love in this audio, and the direction and sound by, once again, Gary Russell is astounding. From the voices of the Silurians to the birds of the Galapagos Islands, to the sound of oars across the ocean, to the cried of the Myrka, there really is a lot to enjoy in this serial. 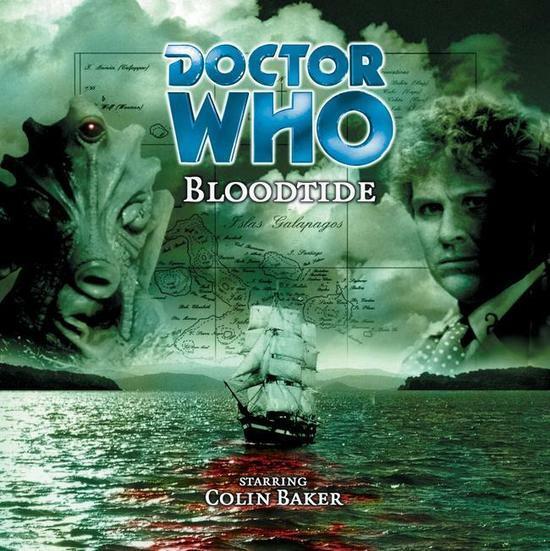 Final Synopsis – Redeeming the Silurians, Bloodtide is an enjoyable historical serial with famous figures, along the lines of The Shakespeare Code and Vincent and the Doctor, if one can avoid the crashing of anvils in the process. 3/5. Next up – In the renovated docklands of South East London, on the bank of the river Thames, the doors of the Dusk are open for business. Bets are called, cards are dealt and roulette wheels spun. As fortunes are won and lost, an inhuman killer stalks the local avenues and alleyways – a killer with a taste for human flesh. Colin Baker is the Doctor in…Project: Twlight. 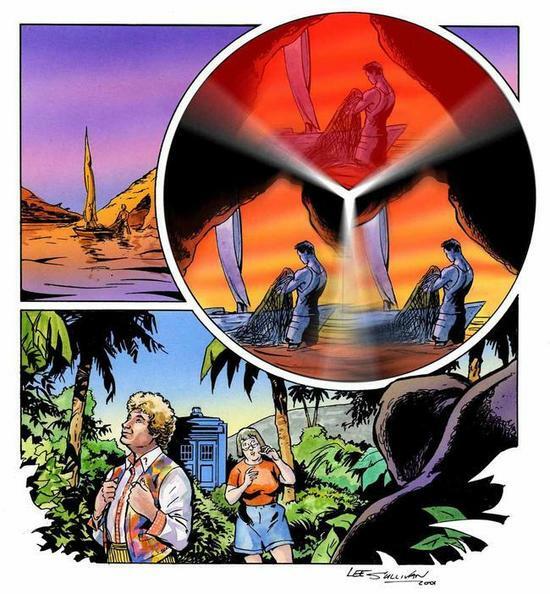 This entry was posted in Big Finish Review and tagged Big Finish, Charles Darwin, Colin Baker, Doctor Who, Evelyn Smythe, Silurians, Sixth Doctor, TARDIS. Bookmark the permalink.